The Warriors is a beat 'em up video game published by Rockstar Games. It was released on October 17, 2005 for PlayStation 2 and Xbox, and February 12, 2007 for PlayStation Portable. 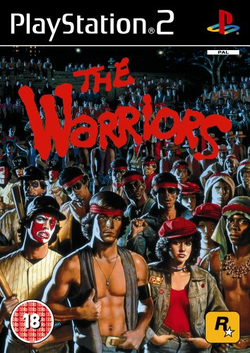 The game is based on the 1979 film, The Warriors. The console versions of game were developed at Rockstar Toronto, while the PSP port was developed by Rockstar Leeds. The story of The Warriors is a loose re-imagining of Anabasis by the Greek author Xenophon. In addition to covering events depicted in the movie, the video game also acts as a precursor, establishing the Warriors' reputation all throughout New York City. Levels 1 through 13 take place before the movie begins. After Level 13, the player is shown a CG cutscene duplicating, to an extent, the beginning of the movie, with Cyrus's meeting. Levels 14 through 18 cover the movie itself. The Warriors is an action-adventure game which focuses heavily on brawling. Like most games from Rockstar Games, several minor gameplay elements are mixed into the experience, such as the ability to use spray paint to mark turf or to insult other gangs. The Warriors focuses largely on gang rumble style action, with the player being assisted by several other Warriors at once. Throughout the game, the player controls one of nine different Warriors. This page was last edited on 30 June 2009, at 17:48.